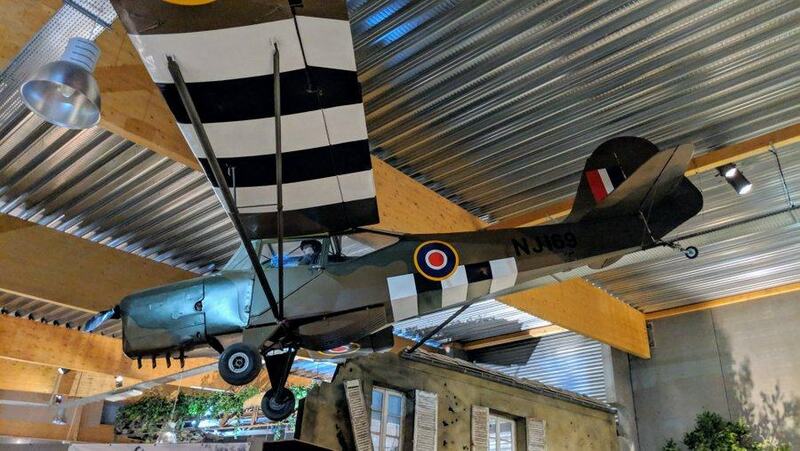 The Overlord Museum is one of the primary museums on the Normandy coast and popular with visitors because it sits next door to the American Cemetery, which is pretty much a ‘must-see’ for most visitors to the area. 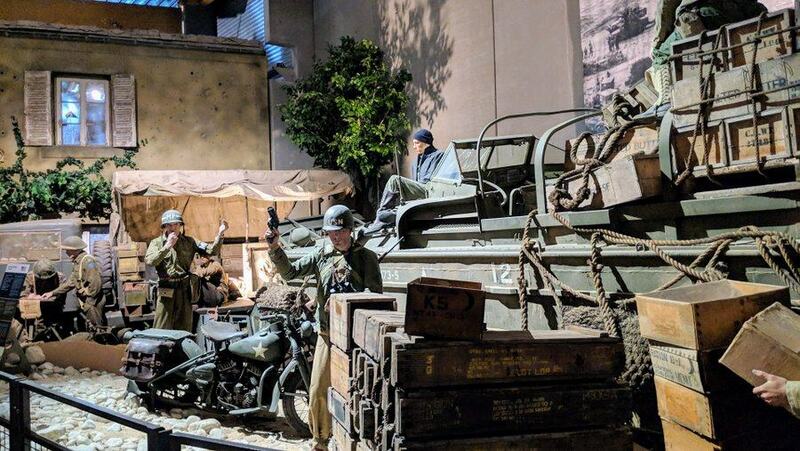 It is not a large museum (that’s about to change¹) but it packs a lot in and presents D-Day equipment, vehicles, weapons and artifacts in really good diorama settings. As one D-Day historian told me, if you are interested in ‘gear’ more than ‘experiences/testimonies’ (you can be interested in both!) then this is one of the key museums for you. I thought these mannequins looked rather young & fresh-faced, but they were. 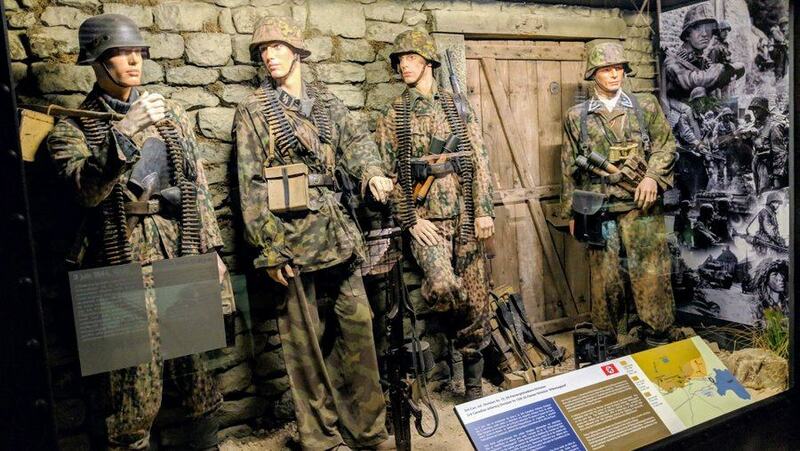 They were from the ‘Hitlerjugend’ Division, and this diorama is based on the famous set of photos of them on the right. 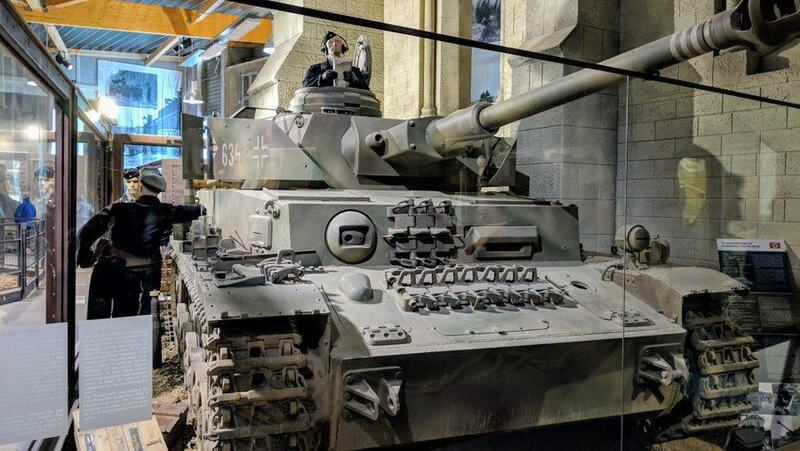 Panzer IV Ausf H tank. A survivor from D-Day. 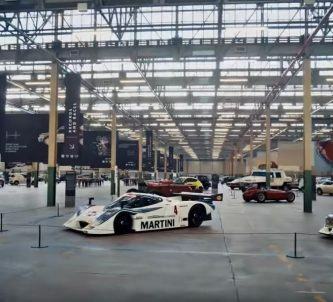 The collection was originally started by Michael Leloup who, as a 15 year old, had watched the invasion taking place around his family farm and then moving on, leaving in its wake a countryside littered with broken vehicles and equipment. Later he started a logging business and used old German & Canadian trucks & half tracks to haul logs. 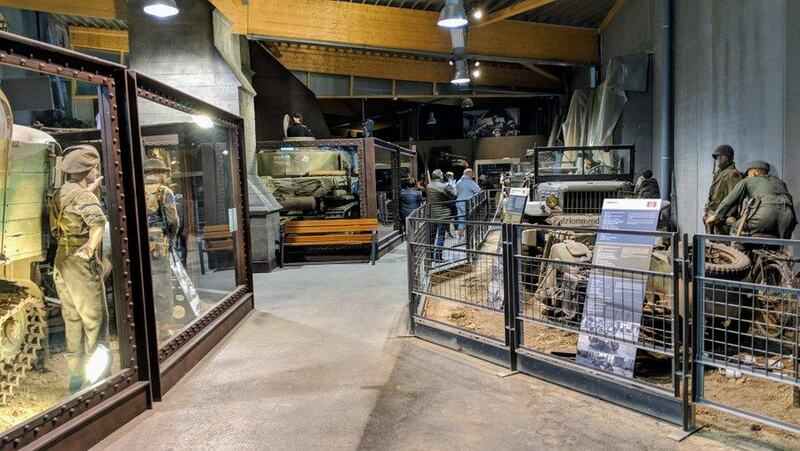 In the seventies he started collecting and restoring military vehicles and in 1987 he put them on display in a former cheese factory in Falaise. This was the start of the collection at the Overlord Museum, a project he sadly never saw completed, before his death in 2011. A year later construction started on the Overlord Museum under the direction of his son, Nicolas Leloup. 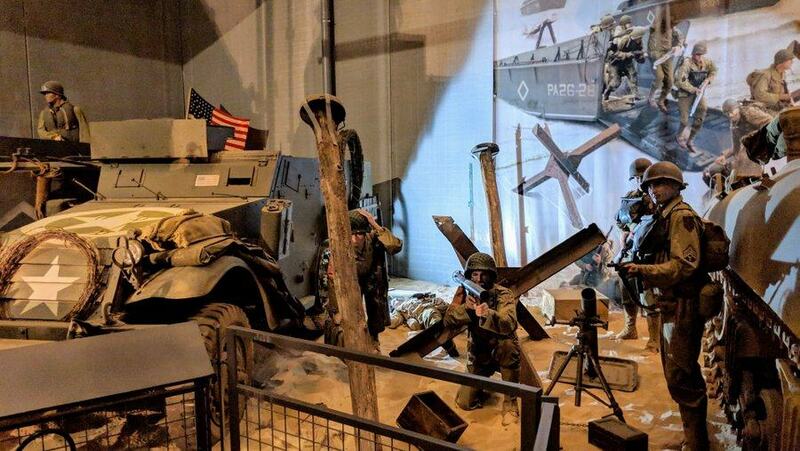 The museum trail starts with a section summarising WW2 ‘events so far’, before focusing on D-Day itself, taking a meandering route past the dioramas of Allied and German forces. Well, you know me; I’m a sucker for rare vehicles and items of equipment that I haven’t seen before so this museum ticked a bunch of boxes for me. To start with, there’s the Goatley Boat. I don’t think I’ve seen one up close before. 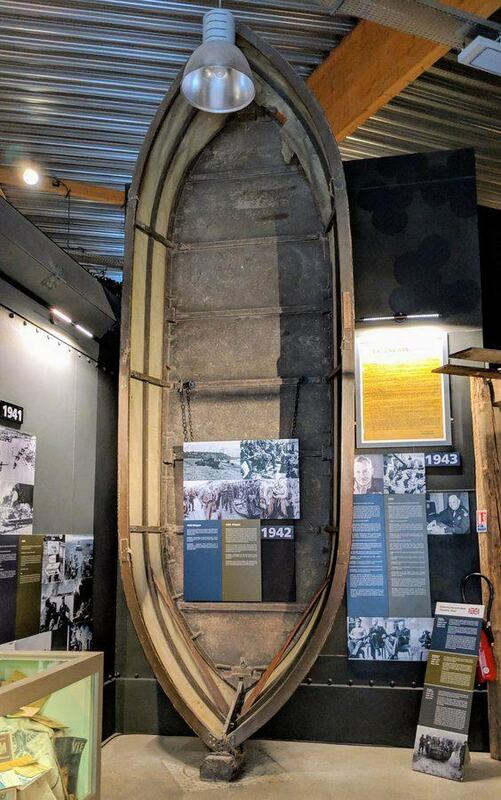 Designed by boatbuilder Fred Goatley of Saunders Roe, it was a collapsible infantry assault boat for 10 men, used by the British Army. The Goatley Assault Boat. Up close it’s just as flimsy as it’s portrayed in the movies! 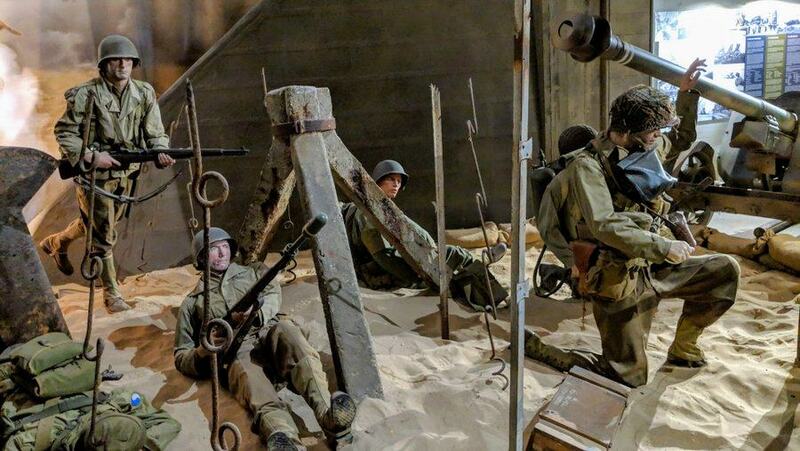 No, the museum isn’t suggesting it was used to assault the beaches of Normandy. 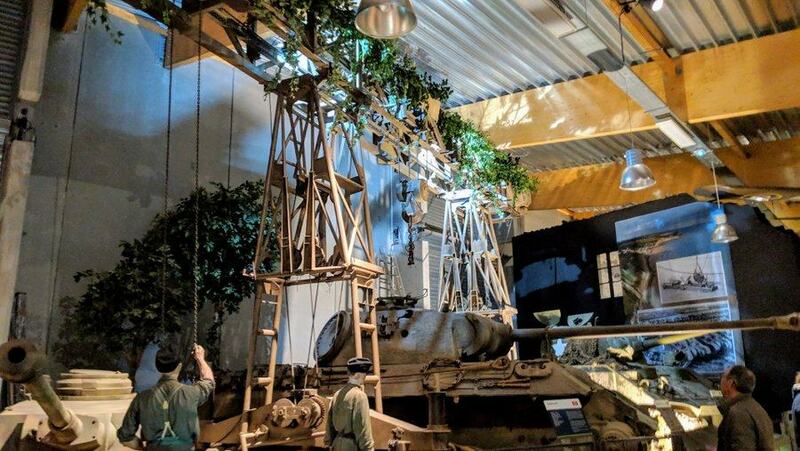 It’s displayed for its role in the failed ‘Dieppe Raid’ of Aug 42, and the lessons learned, in the first section of the museum. Yes, it’s the one Robert Redford (as Major Julian Cook) and his men row furiously across the Waal river in the movie A Bridge too Far. And yes, it’s looks just as flimsy in real life as it did in the movie! 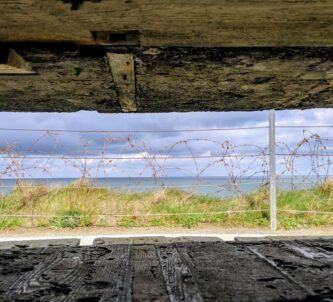 It’s a small thing, but I’ve always known that the Germans littered the approaches to the beaches with obstacles including Teller anti-tank mines on posts under the water, designed to destroy landing craft. 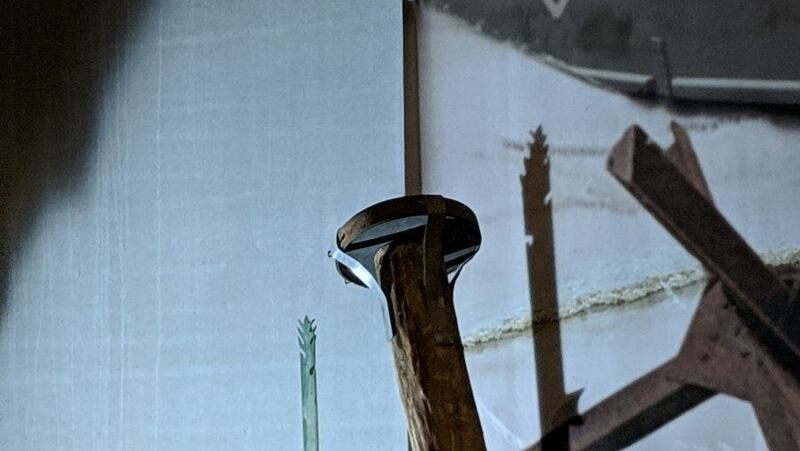 I’ve never looked at them closely, but here at the museum you can see it was a fairly crude arrangement with simple straps holding them in place. They must have had hundreds being washed away all the time. I expect they were replacing them daily at low tide! Check the historic photos and yes, the straps holding the mines in place were just like this. The Schwerer Ladungstrager B IV (Sd Kfz 301), a 5-ton German vehicle about the size of a Bren gun carrier.I’d never heard of it before. Apparently they were a remote control demolition charge delivery vehicle. 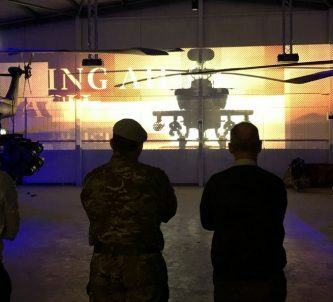 The driver could take it to the front, get out and drive it by radio control to its target up to 2 kms away, where it would lay its 450kg time-delay bomb. On D-Day the 2nd Panzer Division had 146 of them. 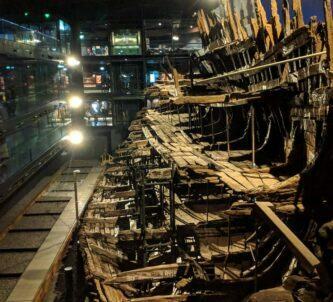 This one is thought to be the only one of four surviving examples that is in running order. 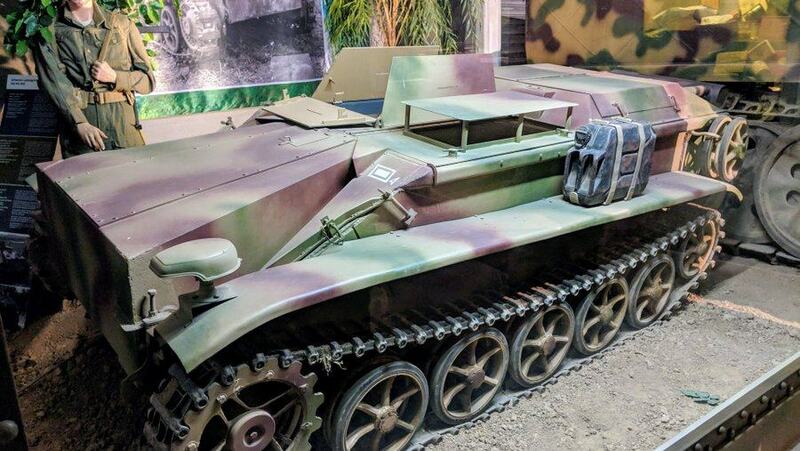 It was found in 1970 in a scrapyard near Le Mans, where it is likely it was dumped by Company 316 of the Panzer Lehr division on their retreat out of Normandy in 1944. The Schwerer Ladungstrager B IV (Sd Kfz 301). Remote control bomb delivery. I’m surprised Amazon haven’t bought the patent! 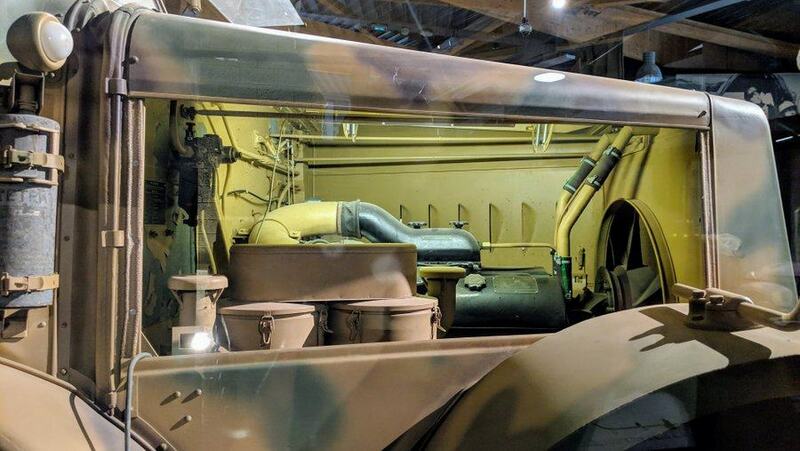 The huge FAMO half track (Sd Kfz 9). I love these monsters, but you don’t see them often. 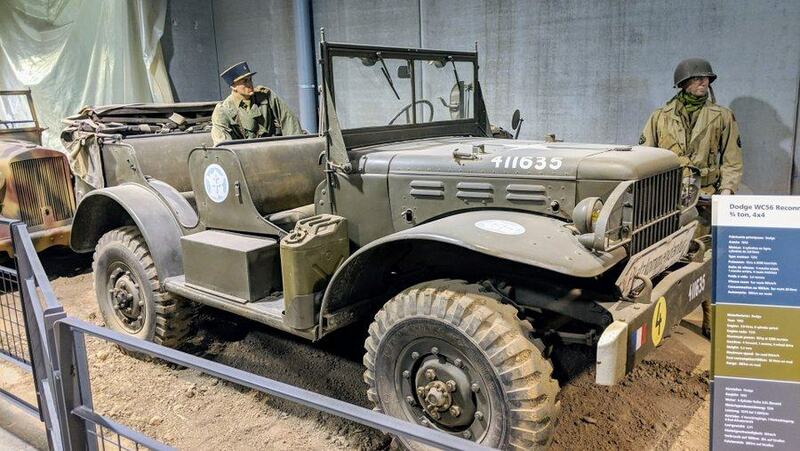 Powered by a 12 cylinder Maybach engine, they were designed to be artillery tractors, but they also got used as recovery vehicles and for other purposes. Ok, what’s interesting about a portable gantry? Well, I suppose it’s that you don’t see a Strabokran 16 ton gantry often – there is only one other in existence. 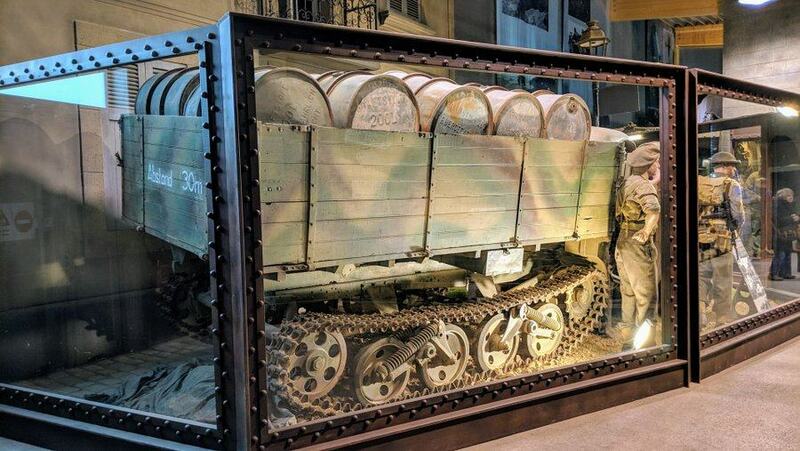 These were used by the German maintenance crews to work on tanks and other vehicles in the field. They were towed by the FAMO above and a crew of 8 engineers could deploy and erect it in 30 minutes. The Strabokran gantry – handy for removing turrets & engines! 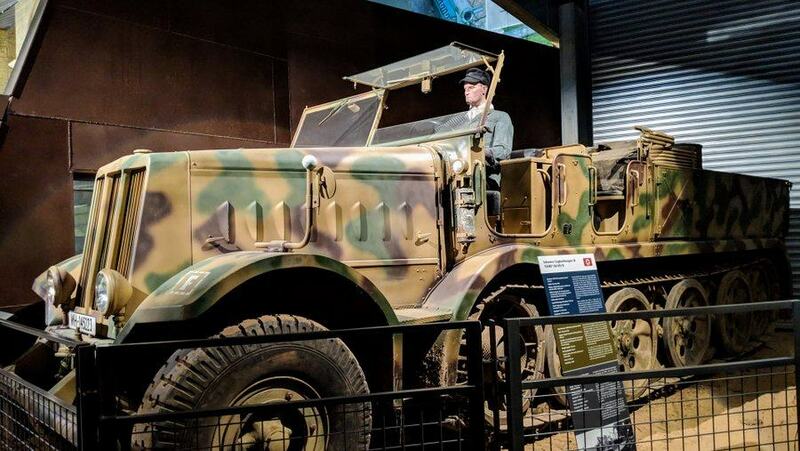 Another German half track, the Gleisketten-Lastkraftwagen 2-ton ‘Maultier’ or ‘mule’ (Sd Kfz 3b). 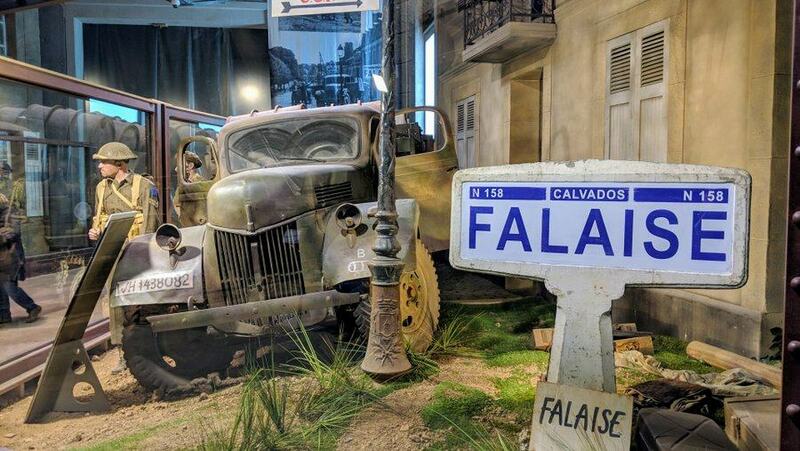 This one was found abandoned on the outskirts of Falaise (see photo) by the canadian 2nd Infantry Division on 17th Aug 1944. 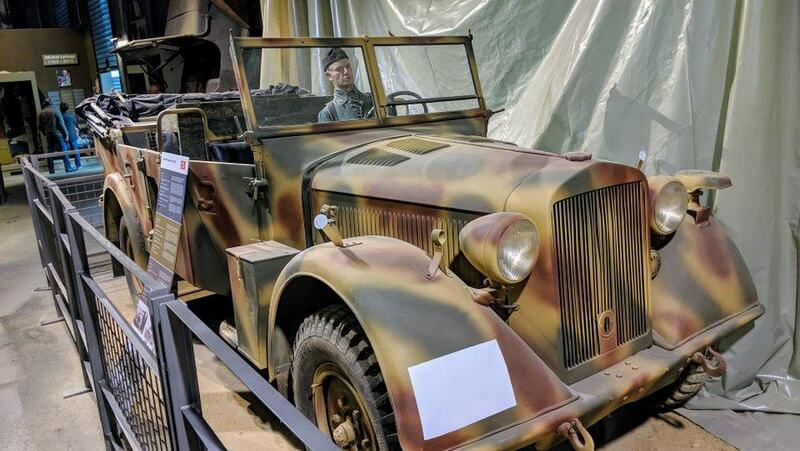 Finally, a pair of fairly rare staff cars – The German Horch 901 (Kfz 15) Staff car and an American Dodge WC56 Command car. These are chunky vehicles. I’d love to tour Normandy in one of these! 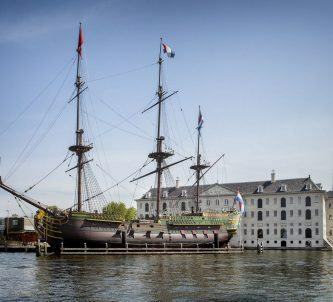 ¹ The museum is currently being expanded from 1400 sq metres to over 2100 sq metres. 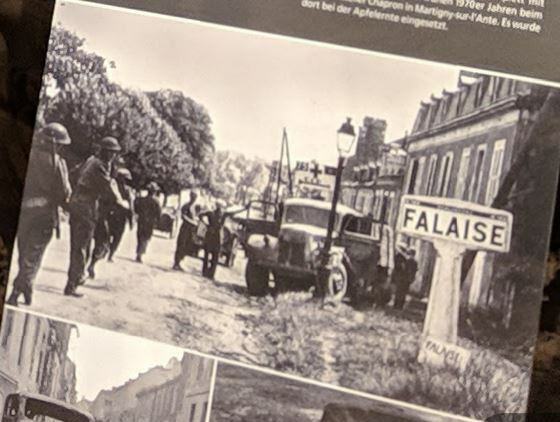 The expansion will include an archive library of documents, books, maps and photographs, a multi-purpose room for school groups and temporary exhibitions, and a new 400 sq metre gallery focusing on the aerial component of the Battle of Normandy. It will have wreckage from a US Air Force P47 Thunderbolt, a German Messerschmitt Bf109, an English Avro Lancaster Bomber, and a section of a US B24 bomber with mannequins and crews in period dress. The extension is expected to open on 3rd June 2019. Declaration: I was on a self-driving press trip as a guest of the Normandie and Calvados tourist offices. Museum entry was complementary. 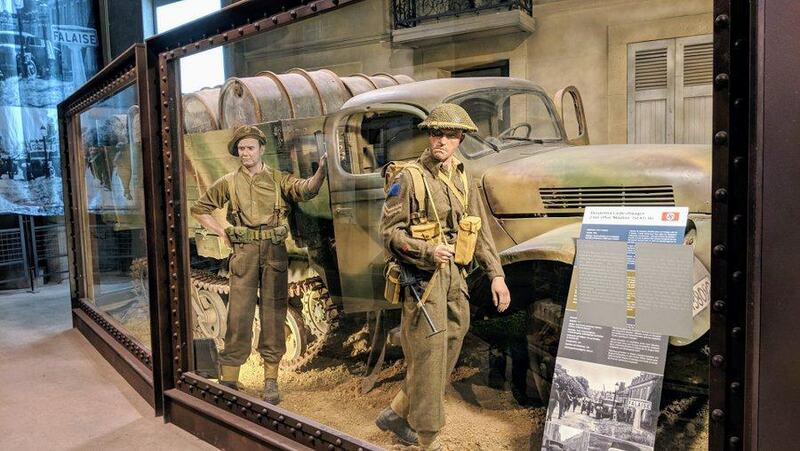 The Overlord Museum is on the D514 roundabout at Colleville-sur-Mer where the short access road to the American Cemetery starts. The is open all year round, except for the 24th, 25th & 31st December and the period (Fermeture Annuelle) from 31st Dec to 9th Feb. Some really interesting and rare vehicles & equipment on display here.